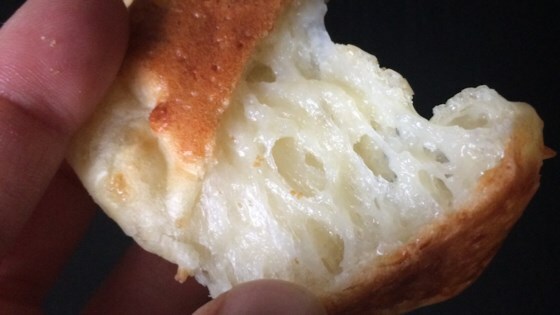 "My husband spent some time in Brazil as an English teacher and this was one of his favorite breads! It is simply delicious and we love serving it with other traditional Brazilian foods (rice, beans, etc). These are best when they are served warm." Bring water, milk, oil, and salt to boil in a large saucepan. Remove from heat; add tapioca starch and mix well. Let cool, 10 to 15 minutes. Transfer tapioca mixture to a large bowl. Add egg and mix well to combine. Fold in Parmesan cheese and knead until dough is smooth but still sticky. Scoop out 1 tablespoon of the dough and roll into a small ball; place on baking sheet. Repeat with remaining dough. Manioc starch ("Polvilho Dolce") is traditionally used in this recipe. Use it instead of the tapioca if preferred.